MSRP: Starting at $125,065 USD. A side slide-out in a van! 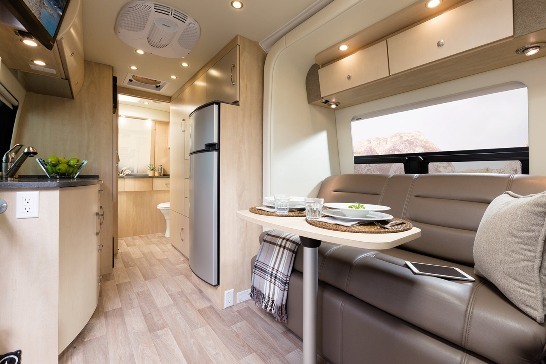 This 2015 Leisure Van Free Spirit SS is a state-of-the-art compact Sprinter Van motorhome. Its full one piece fiberglass slide-out with frameless glass windows gives this van a spacious living area. The interior sofa is made of UltraLeather, has Memory Foam for incredible comfort while sitting or sleeping and easily converts into a full queen size super comfortable sofa bed. A dry 3 piece bathroom with china commode, recessed sink, stand up shower, glass doors, skylight, medicine cabinet, drawer, and storage gives this bathroom a residential feel. You also get a full sliding door with a full sliding screen door for maximum view and fresh air and copious amount of storage. 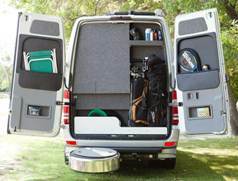 Clean lines and a beautifully designed layout for maximum comfort and function make this van stand out from all the others. The driver’s cabin features full rotating Mercedes Benz UltraLeather swivel seats with French stitching. 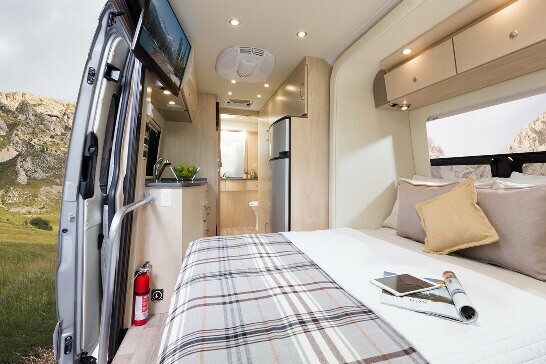 Overall, this van has many of the amenities, comforts and storage of a Class A motorhome, but within a compact van. But the big deal inside this van is the interior storage. Just outside the bathroom is an incredible amount of storage, thoughtfully designed with lots of push button locking drawers and cabinet space. Perhaps the SS in this model stands for Spectacular Storage! 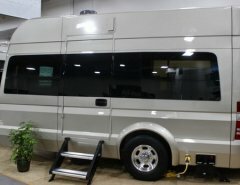 Inside one of the cabinets is the service center containing all you need to control the interior and exterior features of this loaded van motorhome. 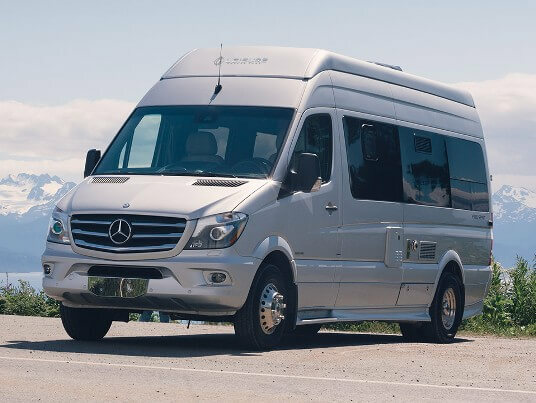 It’s perfect for the single traveler or a couple that doesn’t want the size, weight, or price of a Class A motorhome. 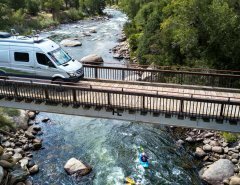 This van also has an exterior shower, a tank-less on-demand hot water heater, a remote propane fill and disconnect, cable connection and a discharge line hose that’s all-in-one. 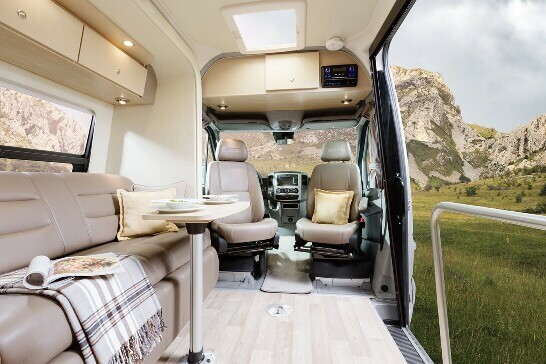 The back of the coach has a back up camera, an optional spare tire which doubles as a bbq area/ picnic table and extra storage in the spare tire area. 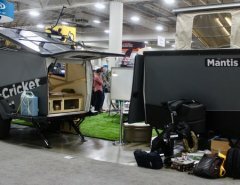 You can also add an optional roof trim kit with a huge power awning of 12’ long by 7’ wide with LED lighting in the awning with tent pegs for very breezy afternoons for added stability. The Mercedes Benz engine/chassis with a 188 horsepower engine, telescoping steering wheel, 325 foot pounds of torque, 5 speed automatic transmission, power windows and locks, remote mirrors, GPS, Bluetooth, Sirius Radio and more, makes this Class B van so easy to move, park and travel with and it can pull up to 5000 lbs!. 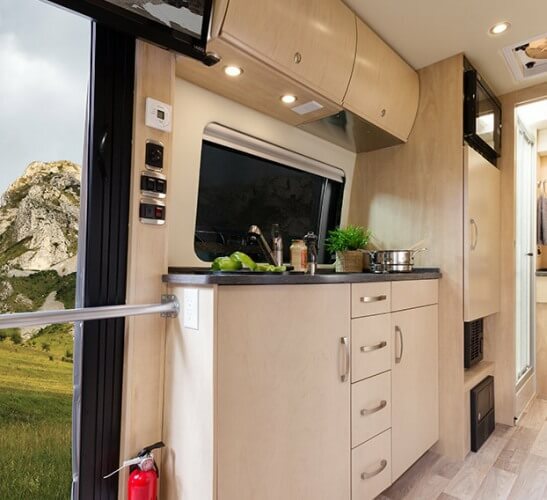 It uses diesel fuel, incorporates an integrated ground effects exterior that is all fiberglass/all painted for an aerodynamic effect, and this model includes a service module like you would have in a big Class A motorhome. You cannot beat how you will feel driving and traveling in this van. It’s definitely worth a test drive.